During his recent visit to Peru, Pope Francis met with indigenous leaders and condemned threats to the Amazon's peoples and forests. He singled out illegal gold mining, a major driver of deforestation. The world's media has moved on – but what is next for those working to improve the artisanal mining sector? "Francis, our friend, you are Amazonian, too" chanted a crowd of nearly 80,000 people gathered in the searing 36-degree heat. They were celebrating the visit of Pope Francis to the Peruvian city of Puerto Maldonado. The city lies at the heart of the Amazon jungle, in the region of Madre de Dios, and is known in Peru as the 'capital of biodiversity'. Local people and indigenous groups from Peru, Brazil and Bolivia welcomed Pope Francis with open arms and uncontained emotion. As the townspeople cheered in the local arena, the Pope held an audience with some 3,500 Amazonian indigenous leaders. 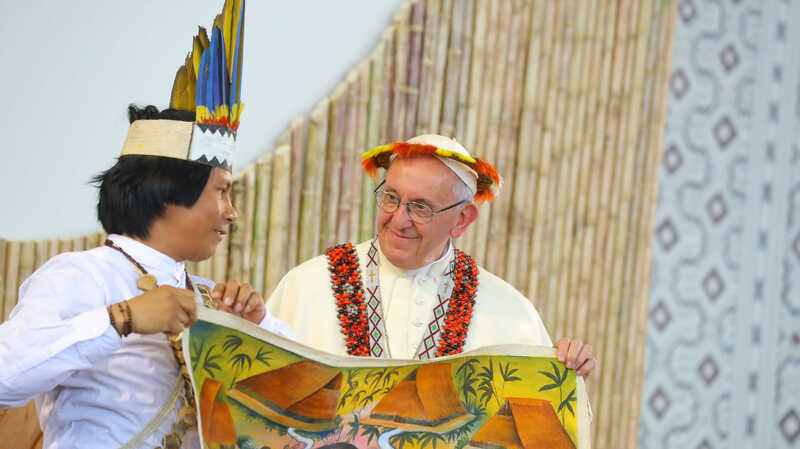 During their unprecedented meeting, Pope Francis and indigenous people discussed issues affecting the Amazon's peoples and environment. The 81-year-old Pontiff, who has previously spoken out on environmental issues, spoke many hard truths. He said that Amazonia is being contested by powerful interests, including extractive and forest industries seeking to exploit its resources or deforest its lands to pursue large-scale agriculture. He condemned the distortion of conservation policies that do not take into account the people who inhabit the forests. He spoke of the heartbreak of girls and women enslaved at the hands of mafias that run Amazonian mining towns and camps with impunity. And, ominously for those of us who work in the artisanal and small-scale mining (ASM) sector, he denounced illegal mining as the cause of both environmental degradation and people trafficking in the Madre de Dios region, whose name paradoxically translates as 'Mother of God'. Illegal gold mining is indeed the source of major environmental and social problems in Madre de Dios. It drives massive deforestation and pollutes soil and water with toxic chemicals such as mercury, affecting even the most isolated communities. 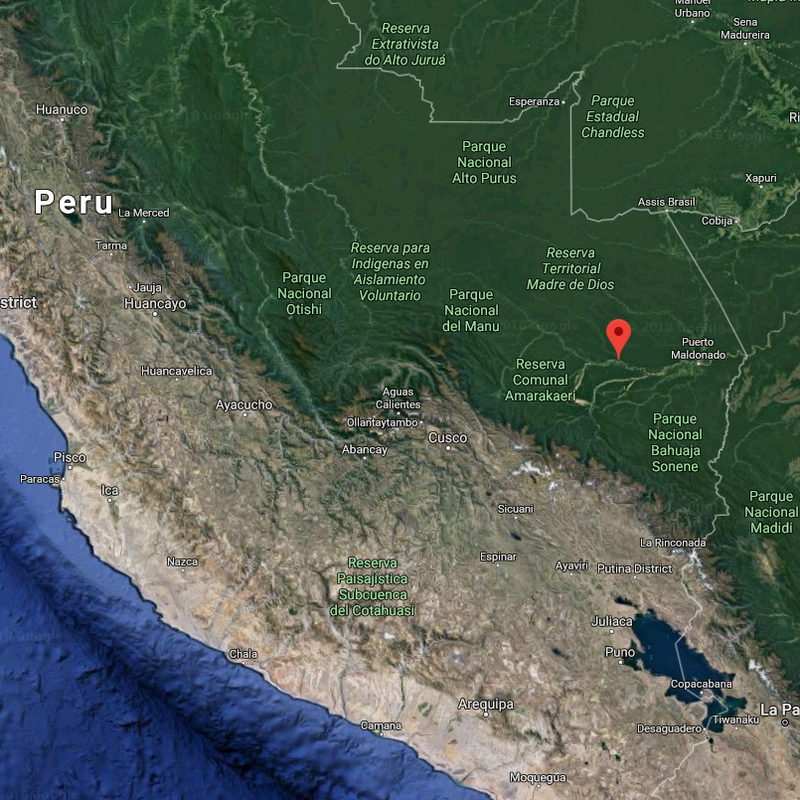 Peru's Energy and Mines Ministry reports that the Madre de Dios region produced 12 million grams of gold in 2017. This is roughly nine per cent of the country's gold production, which is not insignificant as Peru is the world's sixth-largest producer. 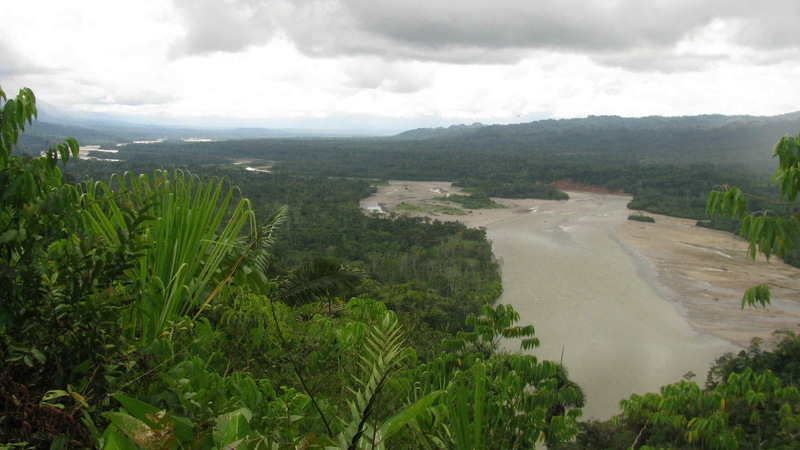 As the Washington Post reported recently, mining in Madre de Dios is big business. While the government has destroyed hundreds of illegal camps and launched investigations to combat people trafficking, the authorities have not been able to stop illegal operations, nor the damage they cause. There is a global community of people that believes that ASM can be the opposite of what we see in Madre de Dios: an engine for local sustainable development. We work towards this through dialogues, policy, technical support and many other ways. But the reality of the illegal gold mining challenge in Madre de Dios is daunting, even for the most optimistic ASM supporter. 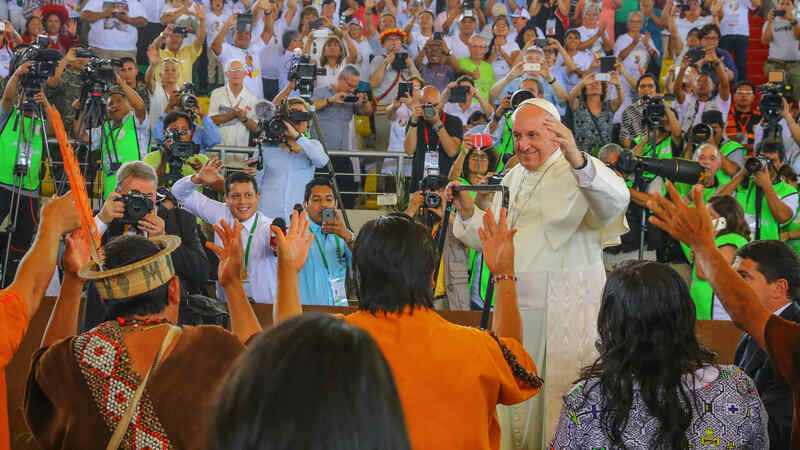 "He really heard what we said to him"
It was against this backdrop that Pope Francis arrived in Madre de Dios to meet with indigenous leaders. There was much anticipation of his visit. 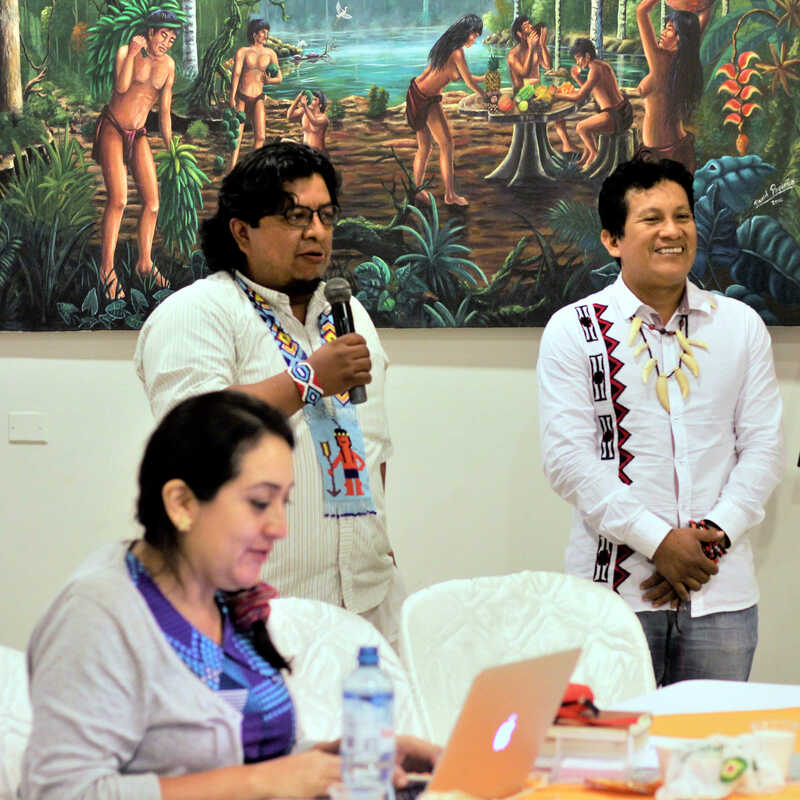 Indigenous leaders had prepared letters (Spanish text) and videos outlining their main worries, including how illegal gold mining is harming the wellbeing of peoples and forests. Many had come with little hope of being heard; the poignancy and breadth of Francis' discussions with them took them by surprise. IIED and partners the Amazonas Sustainable Foundation (FAS), the UN Development Programme and UN Environment, as well as several indigenous organisations, co-hosted a workshop with indigenous leaders the day after the Pope's visit. The aim was to reflect on the Pope's message and draw insights and priorities for achieving the Sustainable Development Goals in the Amazon. Throughout the day, it was clear that participants were still affected by the previous day's events. 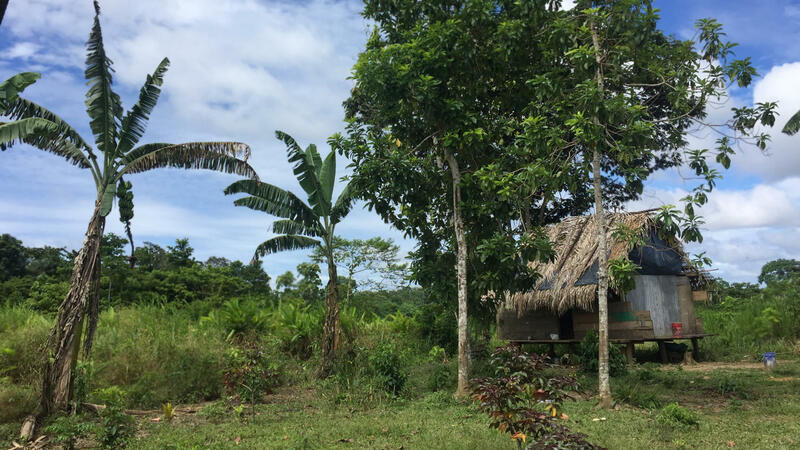 "He really heard what we said to him," said Yesica Patiachi, a leader from the Harakbut people, one of three main ethnic groups in Madre de Dios. People said the combination of being heard and having someone so influential voice their concerns so comprehensively, and with such care, had strengthened them. It was clear that something hugely meaningful had happened. But will anything change? Despite coverage across Peruvian media and the many speeches that followed, the risk is that enthusiasm for creating change will fade, people will feel disheartened and damaging practices will continue unchallenged. But there is reason for hope too. Our workshop benefited from the openness and willingness to collaborate and set common priorities that indigenous leaders brought with them. There is no doubt that their renewed energies were a result of the major global exposure that the Pope created for them. After our workshop, we visited Amarakaeri – a nature reserve jointly managed by native communities and the Peruvian government. Indigenous peoples live in the reserve, protect it and run small enterprises, such as harvesting brazil nuts, to earn an income. As we travelled up the Madre de Dios river towards the reserve, I told our hosts about IIED and partners' plans to convene an Amazon-wide ASM dialogue that could help mobilise stakeholders to deal with the damage caused by illegal gold mining. I also rather tentatively said that while there is illegal and criminal activity linked to gold mining, there are also many people involved who are only trying to make a living. To my surprise, they responded with a flurry of ideas and insights: learning from ancestral mining techniques; taking care of communities' social fabric so they are not corrupted by gold; and setting up a fund so that mining revenues benefit communities. As someone at the workshop said, we have shifted from protest to proposals. It feels to me that if those hurt most by illegal gold mining are already bringing their best to a dialogue that is barely beginning, we may be off to a good start. Gabriela Flores (gabriela.flores.zavala@gmail.com) is a communications specialist and senior associate at IIED. View a collection of photos from the visit of Pope Francis to the Amazon, his discussion with indigenous peoples, and the Amarakaeri nature reserve in the gallery at the bottom of this page. Durante su reciente visita a Perú, el Papa Francisco se reunió con líderes indígenas y condenó los peligros que amenazan tanto a la población de la Amazonía como a los bosques. Destacó la minería ilegal de oro, factor importante de la deforestación. El interés de la prensa mundial en el mensaje papal ya pasó, pero ¿qué queda para los que trabajan por mejorar el sector de la minería artesanal? “Francisco, amigo, es amazónico” coreó una multitud de cerca de 80 000 personas reunidas bajo una temperatura ardiente de 36 grados. Ellos celebraban la visita del Papa Francisco a la ciudad peruana de Puerto Maldonado. La ciudad yace en el corazón de la selva amazónica, en la región de Madre de Dios, y es conocida en el Perú como “la capital de la biodiversidad”. Personas locales y grupos de indígenas de Perú, Brasil y Bolivia dieron la bienvenida al Papa Francisco con los brazos abiertos y una emoción incontrolable. Mientras los pobladores gritaban con entusiasmo en el campus de un instituto local, el Papa sostuvo una audiencia con unos 3 500 líderes indígenas amazónicos. Durante una reunión sin precedentes, el Papa Francisco y los indígenas conversaron sobre los temas que afectan a los pueblos amazónicos y al medio ambiente. El Pontífice de 81 años, quien se ha pronunciado anteriormente sobre temas ambientales, expuso crudas verdades, dijo que la Amazonía está disputada por intereses poderosos, incluyendo a las industrias extractivas y forestales que buscan explotar sus recursos o deforestar sus tierras para promover la agricultura a larga escala. Condenó la distorsión de políticas de conservación que no toman en cuenta a las personas que habitan en los bosques. Habló del sufrimiento de las adolescentes y mujeres esclavizadas en manos de mafias que trabajan con impunidad en los pueblos y campamentos mineros de la Amazónia. Y, ominosamente, para quienes trabajamos en el sector de la minería artesanal y en pequeña escala (MAPE), denunció la minería ilegal como la causa tanto de la degradación ambiental como de la trata de personas en la región de Madre de Dios, nombre que paradójicamente alude a la “Madre de Dios”. La minería ilegal de oro es de hecho la fuente de los mayores problemas ambientales y sociales en Madre de Dios. Esto conlleva a deforestaciones masivas, suelos y agua contaminados con químicos tóxicos como el mercurio, afectando inclusive a la mayoría de comunidades aisladas. Mientras el gobierno ha destruido cientos de campamentos ilegales y ha iniciado investigaciones para combatir la trata de personas, las autoridades no han podido parar las operaciones ilegales ni el daño que ocasionan. Existe una comunidad global de personas que creen que la MAPE puede ser distinta a lo que vemos en Madre de Dios: un motor para el desarrollo sostenible local. Trabajamos hacia ello a través de diálogos, políticas públicas, apoyo técnico y otras muchas maneras. Pero la realidad del reto de la minería ilegal de oro en Madre de Dios es desalentadora, aún para el defensor más optimista de la MAPE. Fue con esta situación como telón de fondo que el Papa Francisco llegó a Madre de Dios para encontrarse con los líderes indígenas. Hubo mucha actividad en preparación de su visita. Los líderes indígenas escribieron cartas (texto en español) y videos dónde resaltaban sus mayores preocupaciones, incluyendo cómo la minería ilegal de oro está dañando el bienestar de las personas y los bosques. Muchos llegaron con poca esperanza de ser escuchados; la intensidad y lo exhaustivo de las conversaciones que tuvieron de Francisco, los tomó por sorpresa. El Instituto Internacional de Medio Ambiente y Desarrollo (IIED por sus siglas en inglés) y los socios de la Fundación Amazonas Sostenible (FAS por sus siglas en portugués), el Programa de las Naciones Unidas para el Desarrollo y el Programa de las Naciones Unidas para el Medio Ambiente, así como diversas organizaciones indígenas, fueron los co-organizadores de un taller con líderes indígenas el día después de la visita del Papa. El objetivo era reflejar el mensaje del Papa y extraer conclusiones y prioridades para alcanzar los Objetivos de Desarrollo Sostenible en la Amazonía. A lo largo del día, era claro que los participantes aún estaban conmovidos por los sucesos del día anterior. “Él realmente escuchó lo que le dijimos,” afirmó Yesica Patiachi, líderesa del pueblo Harakbut, uno de los principales grupos étnicos en Madre de Dios. Los líderes que nos acompañaron mencionaron que la mezcla de ser escuchados y tener a alguien con una voz tan influyente que hable de sus preocupaciones de manera tan exhaustiva, y con tanta preocupación, los ha fortalecido. Estaba claro que algo muy significativo había sucedido. Pero, ¿algo cambiará? A pesar de la cobertura de los medios de comunicación peruanos y los diversos discursos que siguieron, el riesgo es que el entusiasmo por generar cambios desaparezca, las personas se sientan desanimadas y las practicas dañinas continuen inpunes. “El reconocimiento y el diálogo serán el mejor camino para transformar las históricas relaciones marcadas por la exclusión y la discriminación” – Papa Francisco. Nuestro taller se benefició de la apertura y disposición a colaborar y establecer las prioridades comunes que los líderes indígenas presentaron. No hay duda que sus energías renovadas fueron resultado del reconocimiento global que el Papa generó para las temáticas de los pueblos amazónicos. Después de nuestro taller, visitamos Amarakaeri – una reserva natural gestionada conjuntamente por comunidades nativas y el gobierno peruano. Los pobladores indígenas viven en la reserva, la protegen y dirigen pequeñas empresas, tales como la recolección de castañas, para obtener ingresos. 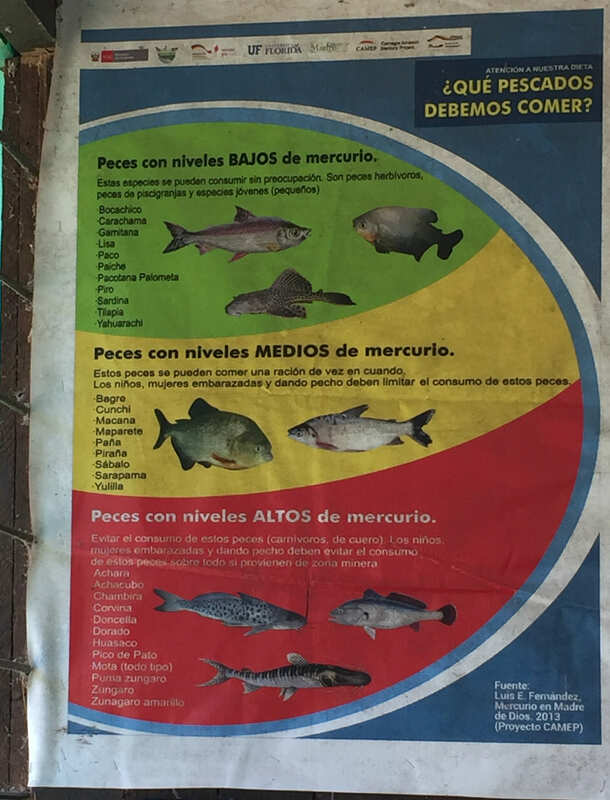 Mientras recorríamos el rio Madre de Dios hacia la reserva, les hablé a nuestros anfitriones sobre los planes del IIED y de sus aliados de organizar un proceso de diálogo sobre la MAPE en la Amazonía que pueda ayudar a movilizar a diferentes actores para enfrentar el daño causado por la minería ilegal de oro. También les comenté que aunque exista actividad ilegal y criminal ligada con la minería de oro, también existen muchas personas involucradas que solo buscan ganarse la vida. Para mi sorpresa, ellos respondieron con una lluvia de ideas y sugerencias como aprender de las técnicas ancestrales de hacer minería; tener en cuenta las estructuras sociales de las comunidades a fin de que no se corrompan por el oro; y establecer un fondo para que las ganancias provenientes de la minería beneficien a las comunidades. Como alguien en el taller dijo, hemos pasado de las protestas a las propuestas. Me parece que si aquellos que se ven más afectados por la minería ilegal de oro ya están dando lo mejor de sí en un dialogo que apenas empieza, podríamos estar ya en un buen punto de partida. Gabriela Flores (gabriela.flores.zavala@gmail.com) es especialista en comunicaciones y asociada senior del IIED. Durante sua recente visita ao Peru, o Papa Francisco se reuniu com líderes indígenas e condenou os perigos que ameaçam tanto a população da Amazônia como a das florestas. Destacou a mineração ilegal do ouro como um fator importante do desflorestamento. O interesse da imprensa mundial na mensagem papal já passou, mas o que fica para os que trabalham por melhorias no setor da mineração artesanal? "Francisco, amigo, é amazônico" gritava uma multidão de cerca 80.000 pessoas reunidas debaixo de uma temperatura ardente de 36°C. Eles celebraram a visita do Papa Francisco a cidade peruana de Porto Maldonado. A cidade fica no coração da selva Amazônica, na região de Madre de Dios, e é conhecida no Peru como "A capital da biodiversidade". Pessoas locais e grupos indígenas do Peru, Brasil e Bolívia deram as boas-vindas ao Papa Francisco com os braços abertos e uma emoção incontrolável. Enquanto os moradores gritavam com entusiasmo no campo de um instituto local, o Papa realizou uma audiência com 3.500 líderes indígenas amazônicos. Durante uma reunião sem precedentes, o Papa Francisco e os indígenas conversaram sobre os temas que afetam aos povos amazônicos e ao meio ambiente. O Pontifício de 81 anos, que já se pronunciou anteriormente sobre temas ambientais, expôs cruas verdades, disse que a Amazônia está disputada por interesses poderosos, incluindo as indústrias extrativas e florestais que buscam explorar seus recursos ou desmatar suas terras para promover a agricultura em larga escala. Condenou a distorção de políticas de conservação que não levam em conta as pessoas que vivem nas florestas. Falou do sofrimento dos adolescentes e mulheres escravizadas nas mãos das máfias que trabalham com a impunidade em aldeias e campos de mineração na Amazônia. E, ameaçadoramente, para aqueles que trabalham no setor da mineração artesanal e em pequena escala (MAPE), denunciou a mineração ilegal como a causa tanto da degradação como do tráfico de pessoas na região de Madre de Dios, nome que paradoxalmente alude à "Mãe de Deus". A mineração ilegal de ouro é de fato a fonte dos maiores problemas ambientais e sociais em Madre de Dios. Isto implica nas desflorestações massivas, solos e águas contaminadas com químicos tóxicos como o mercúrio, afetando inclusive a maioria das comunidade isoladas. O Ministério de Energia e Minas do Peru alega que a região de Madre de Dios produziu 12 milhões de gramas de ouro em 2017. Isso é aproximadamente 9% da produção de ouro do país que não é insignificante tendo em conta que o Peru é o sexto maior produtor do mundo. Assim com o informou recentemente, o jornal Washington Post, a mineração em Madre de Dios é um "grande negócio". Apesar do governo ter destruiu centenas de acampamentos ilegais e ter iniciado investigações para combater o tráfico de pessoas, as autoridade não puderam para as operações ilegais e nem os danos que ocasionaram. Existe uma comunidade global de pessoas que creem que a ASM pode ser diferente da que vemos em Madre de Dios: um motor para o desenvolvimento sustentável local. Trabalhamos em direção deles e através de diálogos, políticas públicas, apoio técnico e outras maneiras. Mas a realidade dos desafios da mineração ilegal do ouro em Madre de Dios é desesperançosa, ainda para o defensor mais otimista da MAPE. "Realmente ouviu o que lhe dissemos"
Foi com esta situação como pano de fundo que o Papa Francisco chegou a Madre de Dios para se encontrar com os líderes indígenas. Houve muita preparação para sua visita. Os líderes indígenas escreveram cartas (texto em espanhol) e vídeos onde ressaltam suas maiores preocupações, incluindo como a mineração ilegal de ouro que está prejudicando o bem- estar das pessoas e das florestas. Muitos chegaram com pouca esperança de serem escutados; a intensidade e as conversações minuciosas que tiveram com Francisco, os tomou de surpresa. O Instituto Internacional de Meio Ambiente e Desenvolvimento (IIED na sigla em inglês) e os sócios da Rede de Soluções para o Desenvolvimento Sustentável da Amazônia (SDSN na sigla em inglês), Fundação Amazonas Sustentável (FAS), o Programa das Nações Unidas para o Desenvolvimento (PNUD) e a ONU Meio Ambiente, assim como diversas organizações indígenas, foram os co-organizadores de um workshop de líderes indígenas um dia após a visita do Papa Francisco. O objetivo desse encontro, era refletir a mensagem do Papa e assim, extrair conclusões e prioridades para alcançar os Objetivos de Desenvolvimento Sustentável (ODS) na Amazônia peruana e brasileira. A longo do dia, era claro que os participantes ainda estava comovidos pelos sucesso do dia anterior. "Ele realmente escutou o que lhes dissemos", afirmou Yesica Patiachi, liderança indígena do povo Harakbut, um dos principais grupos étnicos em Madre de Dios. Os líderes que nos acompanharam mencionaram que a mistura de serem ouvidos e terem alguém com uma voz tão influente que fale de suas preocupações de maneira tão completa, e com tanta preocupação, os fortaleceu. Estava claro que algo muito significativo sucedido. Mas, algo mudará? Apesar da cobertura dos meios de comunicação peruanos e dos diversos discursos que seguiram, o risco é que o entusiasmo por gerar mudanças, desapareça. As pessoas se sintam desanimadas e as práticas danosas continuem impunes. Mas também existem razões para ter esperança. "O reconhecimento e o diálogo serão o melhor caminho para transformar as históricas relações marcadas pela exclusão e a discriminação"- Papa Francisco. 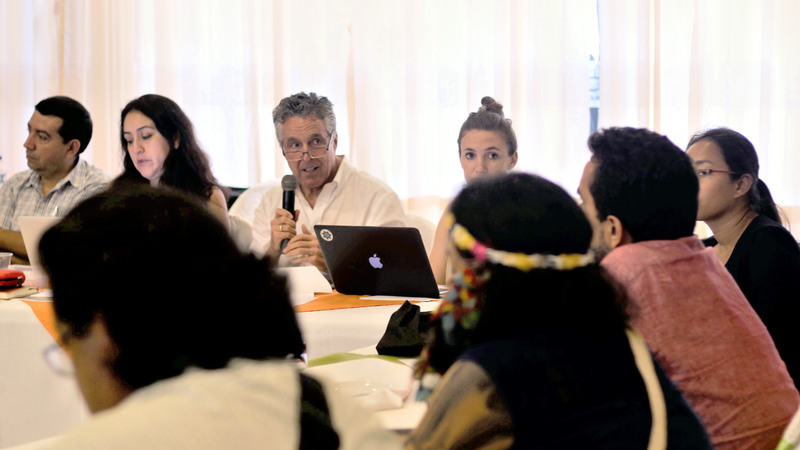 Nosso workshop se beneficiou da abertura e disposição para colaborar e estabelecer as prioridade comuns que os líderes indígenas apresentaram. Não existe dúvida que suas energias renovadas foram resultado do reconhecimento global que o Papa gerou para as temáticas dos povos amazônicos. Depois do nosso workshop, visitamos a Amarakaeri - uma reserva natural gestionada conjuntamente por comunidades nativas e o governo peruano. Os moradores indígenas vivem na reserva, a protegem e dirigem pequenas empresas, tais como o manejo das castanhas para obterem ingressos. Enquanto estávamos percorrendo o rio Madre de Dios para a reserva, falei com nossos anfitriões sobre os planos do IIED e seus aliados para organizar um processo de diálogo sobre a ASM na Amazônia que pode ajudar a mobilizar diferentes atores para lidar com os danos causados pela mineração ilegal de ouro. Também falei - comentei, que existem muitas pessoas envolvidas que somente buscam ganhar a vida. Para minha surpresa, eles responderam com uma chuva de ideias e sugestões como aprender as técnicas ancestrais de fazer mineração; ter em conta as estruturas sociais das comunidades a fim de que não se corrompam pelo ouro; e estabelecer um fundo para que os ganhos provenientes da mineração beneficiem as comunidades. Como alguém no workshop disse, temos passado dos protestos as propostas. Me parece que, se aqueles que são mais afetados pela mineração ilegal de ouro já estão dando o melhor em um diálogo que está apenas começando, já estaríamos em um bom ponto de partida. Uma visão da coleção de fotos da visita do Papa Francisco a Amazônia, sua conversação com as populações indígenas e abaixo a galeria da reserva natural de Amarakaeri.